Preamp/Booster/Compressor and upper harmonic enhancer. This musical tonal combination is totally adjustable with your picking attack and guitar volume pot. The amount of boost depends on the input signal level and HOT/COOL switch position. The maximum is about +10dB on lower level notes and average is about +6dB. 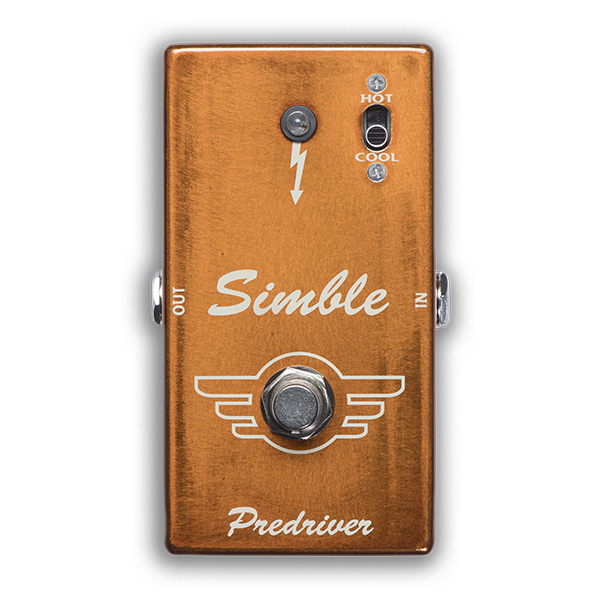 Simble Predriver’s special circuitry uses low noise transistor with high input impedance (over 2 Mohm) so you can boost even piezo pickups without tone loss. The output impedance is 50 Kohm so it works even in front of fuzz pedals. The power consumption is very small if you remove the input jack when not playing you can use the pedal with a 9V battery for few years! CONTROLS HOT/COOL: to match your instruments pickups and your taste. ELECTRICAL SPECIFICATIONS Power: 9V DC (negative terminal at DC-jack tip) Power consumption: 2,5 mA pedal ON/0,1 mA pedal OFF at 9VDC Input impedance: > 2Mohm Output impedance: < 50 kohm Using DC-power jack removes the battery from the circuit POWER REQUIREMENTS 6F22 9V battery or DC eliminator 2.1 mm plug center negative and positive sleeve. When LED dims, it is time to change the battery.